The goal of the game is to get the highest score by throwing your dice and achieving the best possible combinations with them. The game is played with up to four players and supports three rules presets as well as an option to customize your own rules. Online play will use the “classic” ruleset. Each player starts their turn by throwing five or six dice, depending on the rules. You can choose to reroll any or all of those dice two more times, setting aside the ones you wish to keep for the moment. 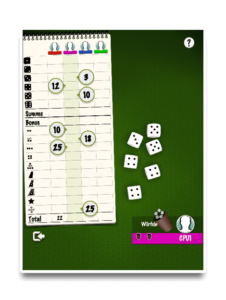 You can choose to score your dice at any time, but you have to score them after the second reroll. The last roll made always counts. You can never undo a roll. After scoring your dice, the next player starts their turn. This continues until a score has been entered for each category in the score sheet. 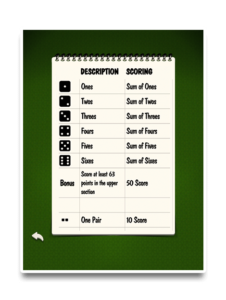 The scoring sheet consists of two sections, each with a number of categories that can each be scored once per game. You do not need to meet the requirements of a category but if you don’t, you will get 0 points for that category. 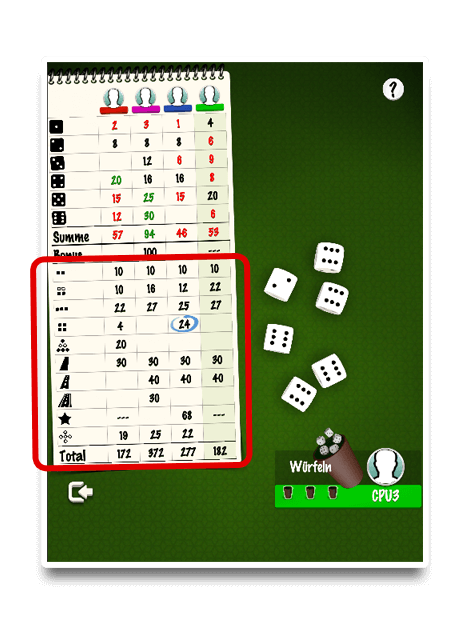 In the upper section you will be able to score the sum of your dice that rolled the same number of pips, with one entry each for ones, twos, threes, fours, fives and sixes. For example, you rolled 3-4-4-4-5-5. 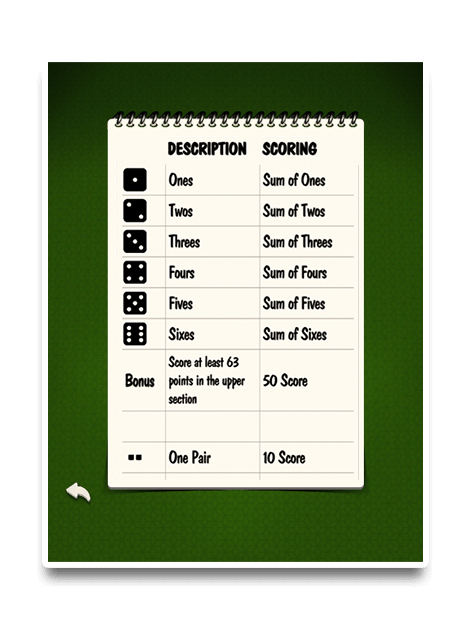 You can score this as 3 points in the category “threes”, 12 points in the category “fours”, or 10 points in the category “fives”. There is also a “sum” category for the upper half that adds up the six categories. If you reach at least 63 points in a game with five dice or 84 points in a game with six, you will receive a bonus, which you will find beneath the “sum” category. The bonus can be 35, 50 or 100 depending on the rules preset. To remind you of how well you’re doing, hitting the mark exactly will result in a black number, staying below will result in a red number, and scoring more will result in a green number. This should help you track your progress towards the bonus points. Hint: The requirement for the bonus can be fulfilled by scoring exactly three dice for all six categories when playing with five dice or scoring four dice for each category when playing with six dice. The lower section of the scoring sheet requires certain combinations to be rolled. Each combination will either give a fixed number of points, the sum of all dice rolled, or the sum of the dice used to achieve the combination. For example, 1-1-2-4-6 could score as 10 points just for getting the combination, 14 points for the sum of all dice, or 2 points for the sum of the two ones used to achieve the combination. The specific scoring changes depending on the chosen rules preset and can be customized for offline games. The available combinations also depend on the rules preset and the number of dice. Any two dice with the same number of pips. Any three dice with the same number of pips. Any four dice with the same number of pips. Any pair with any other three-of-a-kind for five dice, or any other four-of-a-kind for six dice. Any four dice in ascending order. Alternatively, exactly the numbers 1-2-3-4-5 depending on the rules preset. Any five dice in ascending order. Alternatively, exactly the numbers 2-3-4-5-6 depending on the rules preset. The numbers one through six. All dice rolled show the same number of pips. This will simply score the sum of all your dice. It can be used, if you have no other combination available and still want to get points. You can always tap the “?” in the top left or right corner during a game to see the exact scoring conditions for your current game. If you want a little bit more flexibility, you can set how pairs are counted in the custom rules section from 1-1-2-2-3-3 to 1-1-2-2-1-1. This will allow you to score any four-of-a-kind as two seperate pairs. Otherwise, every pair will have to be distinct. For a more challenging experience, there is an option in the custom rules section to force scoring in order from top to bottom. This means, you will start with ones, then twos, then threes and so on until you finally score the chance. You can access the rules by pressing the small book button in the lower right corner of the screen. How do I change the number/names of players in the offline mode? When you choose “Play Offline” on the main screen the “Game Settings” will open. Three CPU players will be displayed. You can now change the names, the number and even the type of players you want to compete with. In order to change the name of the player, press the preset name CPU1/CPU2/CPU3 and your keyboard should open. Now you can name the player as you like. You can change the number of players by selecting the human, phone or x symbols. By selecting the human icon, you choose to play against other human players on your personal device. By selecting the phone icon, you choose to play against computer players. By selecting the x icon, you choose not to play against this player. The number at the top indicates how many players are participating in the game. Please note that solo games do not count in the statistics. How does the online scoring system for Yatzy work? For every game won the player receives 3 points in the leaderboard. For every game that ends in a draw the player receives 1 point in the leaderboard. If the player loses the game or leaves it prematurely, they do not receive any points. When I tap the writing pad to enter points, they are suddenly in the wrong place. What should I be aware of? Tap on one of the result bubbles that appears to note diced scores in the writing pad. This is the only way to note the points correctly. The writing pad itself is only a background image and cannot be used. If you click on a box of the pad, the game selects the closest bubble.